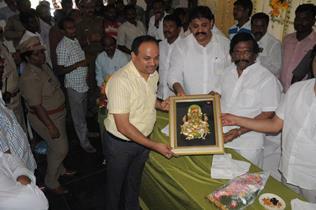 Sri K Anil Kumar CMD felicitated by Sri. Sidda Raghavarao Hon'able minister for R&B govt. of Andhra Pradesh on the occasion of inaugural function of Road Transport Authority Office Building and scientific driving testing tracks at Proddatur in YSR District. G+3 pattern houses at vambay colony, Vijayawada Municipal Corporation. 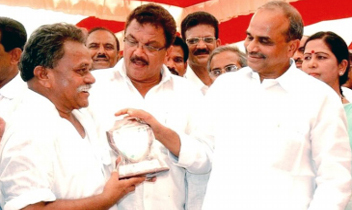 Sri Rosaiah, Hon'ble Chief Minister | Lagadapati Rajagopal – MP Vijayawada. 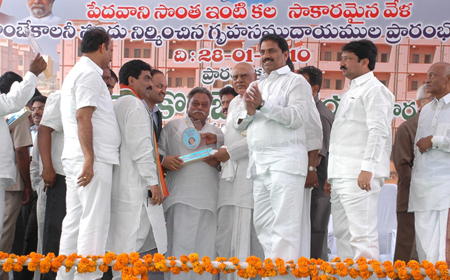 Sri Y.S Rajashekhar Reddy, Hon'ble Chief Minister has felicitated Sri K.C Pullaiah Gaur, Chairman KCP Projects Ltd., by presenting the Memento for speedy completion of the Housing Colony under Rajiv Gruha Kalpa at Kadapa the Inaugural Function of the Project. Sri Nara Chandra Babu Naidu, Hon'ble Chief Minister and Minister for Tourism have felicitated Sri K.C Pullaiah Garu, Chairman KCP Projects, by presenting the Memento for speedy completion of the Construction, during the Inaugural Function of the Project.